A classic English novel is retold here in graphic novel format. 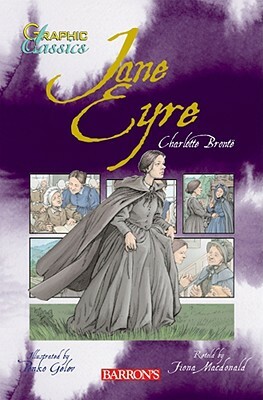 Set in nineteenth-century England is this story of Jane Eyre, the governess at Thornfield Manor, and Rochester, lord of the manor. They haven fallen in love, but Rochester harbors a tragic secret that threatens to keep them apart. Barron's popular and growing series of Graphic Classics titles introduce many of the world's literary masterpieces to young readers. Elementary and secondary school teachers will value these books as a way to make great novels and plays accessible to their students--especially to those students who resist reading. Presented in graphic novel format, each title tells an absorbing, fast-paced story dramatized with high-quality color illustrations. After delving into any of these stimulating titles, many boys and girls will feel encouraged to discover the joy of reading the masterworks in their original form. Each Graphic Classics title includes a thumbnail biography of the author, a list of his or her important works, a timeline of historic events that helped inspire the story, general notes, and an index. Graphic Classics titles are available in both paperback and hardcover editions.